Anglo-Vernacular School, also better known as Sangeet Shala in olden days, is located near Sursagar Lake. 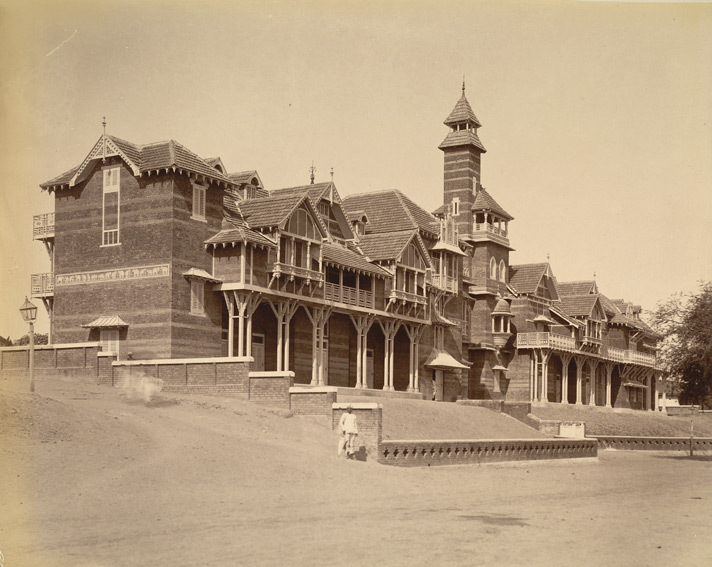 It was founded by Maharaja Sayajirao Gaekwad III in year 1886. After the start of The Maharaja Sayajirao University of Baroda, it became its part, now known as Faculty of Performing Arts. Gaayan Shala, as it was earlier known, was the first school of music in India. This is a unique faculty of its kind in western India, which gives training of performing arts like Music, Dance, Drama. Ph.D. courses are also offered in these areas. Students from many foreign countries like USA, Nepal, Japan, Mauritius also study here. Ustad Maula Bux, under the patronage of Maharaja Sayajirao Gaekwad III started gaayan shala on 26th february 1886. After in year 1899, it was led by Ustad Murtuza Khan & later on by Russian jew Mr. Fredlis, who was the then manager of Baroda State Band. Some of the renowned musicians later on joined on the staff of the college were, Ustad Tasadduq Hussain Khan, Aftab e Mousiqui Ustad Faiyaz Hussain Khan ‘Rangeele’, Ustad Atta Hussain ‘Ratanpiya’, Ustad Nissar Hussain Khan of Rampur gharana and Gayanacharya Pandit Madhusudan Joshi. The renowned Musicologist Pandit V. N. Bhatkhande was invited to restructure music education and evolved graded system for the first time. In year 1916, the department hosted historic first Music conference of United India led by Pandit Bhatkhande and patronized by Maharaja Sayajirao Gaekwad III, in which 400 stalwarts attended from all over India and neighboring countries. Eversince the revolution in Music education took place. A set of text books as written and prescribed by Pandit Bhatkhande was introduced under the Principal ship of Shri Hirjibhai Doctor since 1928. The degree course in Music was introduced in the department of music since 1950. Four more disciplines viz. Vocal, Tabla, Sitar, Violin and Dilruba were introduced in the department. The institute was called as “The college of Indian classical music, Dance & Dramatics”. The institution was awarded the status of a separate faculty from 26/3/84, and was named as Faculty of Performing Arts of The Maharaja Sayajirao University of Baroda.